Above: Not your grandmother&apos;s biscochitos. Photographs by Douglas Merriam. CELINA ALDAZ-GRIFE, founder and co-owner of Celina’s Biscochitos, in Albuquerque, says her biscochitos often bring customers to tears as they think back to their own grandmothers, aunts, or mothers baking the customary Christmas cookie. 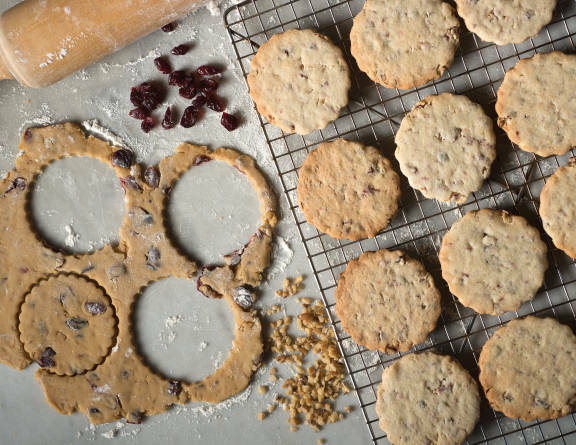 Traditionalists, though, have sometimes become heated upon discovering that she’s riffed on the recipe with versions like red chile, green chile–pecan, lemon, and walnut-cranberry. “One thing I’ve learned is that it’s extremely personal to people,” Aldaz-Grife says. “I went into this thinking I was just making cookies. I realized I’m making something that means so much more.” Even as she adapts her grandma Maggie’s biscochito recipe, she makes sure each one is recognizably a biscochito. “We don’t want to stray away so far from the tradition that you can’t taste the original,” she says. Read more: Check out our Top 20 Favorite New Mexican Foods. When he was in elementary school, Jeff Posa’s side gig was lugging buckets of tamales made by his grandmother Aurora Lujan to sell at the Roundhouse. She founded the tamale-centric family business in 1955 and ran it until his parents took over in 1976. Jeff took the helm in 1990, overseeing Posa’s El Merendero Tamale Factory and Restaurant, renowned for making each tamale by hand—about 12,000 a day during the Christmas season. In addition to ordering the classics, customers requested vegetarian and vegan options, so Posa’s added green chile–cheese and calabacitas–black bean varieties, which have become a tradition over time, too. Marie Coleman, Church Street Café’s owner, based the Albuquerque restaurant’s menu on her aunt Regina’s family recipes. Regina Jaramillo didn’t have a green chile posole in her recipe box, but when customers asked for it, the cooks ginned up a version with Hatch green chile. Coleman says diners like having the choice of red or green, even when it comes to their posole. Or they can opt for both and get it “Christmas.” And what’s more festive than that? Celina Aldaz-Grife bakes this variety from November through Christmas; $17 for two dozen, in person or online (404 Osuna Road NW, Suite A, Los Ranchos de Albuquerque, 505-269-4997, celinasbiscochitos.com). Separately, cream lard with sugar and aniseed. Add eggs one at a time until blended well. Add orange juice and brandy in a steady stream. Begin to add dry ingredients, including cranberries and walnuts, to the creamed mixture a little at a time. Hands are best for working the dough until it is somewhat flaky, like pie crust. On a lightly floured surface, begin to roll out the dough. It should be a quarter-inch thick. Cut out cookies, place on cookie sheet, and bake until lightly golden to golden, 7–12 minutes. Let cookies cool for at least a minute and then dunk them in the cinnamon-sugar mix. Place on a cookie rack until completely cooled. This was a popular item last year, and Chef Brent Moore plans to bring this recipe back to his winter menu. He garnishes it with a glass-like ginger candy and candied pepitas (pumpkin seeds) to highlight contemporary culinary techniques (2401 12th St. NW, Albuquerque, 505-724-3510, puebloharvestcafe.com). Place all ingredients in large saucepan, bring to boil, then reduce to a simmer for 20–25 minutes, stirring frequently. When finished, pumpkin should be easy to flatten with the back of a spoon. Allow to set and cool slightly. Sprinkle with candied pepitas (recipe below) and garnish with fresh or fried sage leaves. Enjoy warm. Place half the sugar and all of the water in a saucepan and stir while bringing to a boil. Add pepitas, stir, and simmer 10 minutes. Drain the pepitas. Arrange on a lightly greased sheet pan. While they’re warm, cover in the remaining sugar, tossing until all are coated well. Let cool at room temp in an even layer. 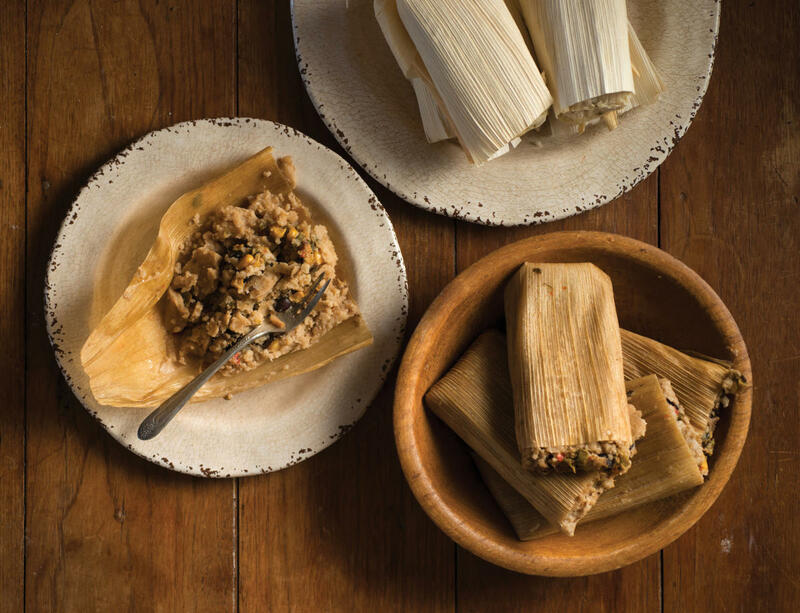 Lucky Santa Feans can walk into El Merendero (Posa’s) for fresh tamales, but the company also ships nationwide; 10 tamales for $19.75 plus shipping (1514 Rodeo Road, Santa Fe, 505-820-7672). To start: Soak 24 cornhusks in warm water for about 30 minutes until pliable while preparing the other ingredients. Combine all of the above ingredients and mix well either by hand or with a mixer, until masa is smooth. Combine all ingredients and mix thoroughly by hand. If you enjoy a little more bite in the tamale, add another 6–8 ounces of diced green chile. Spread about 4 tablespoons of prepared masa on a cornhusk, covering about of it. Place 4 tablespoons of the filling on top of the masa in the center. Gently fold the left side of the husk over the center so that the masa covers the filling. Repeat on the right side. Fold edges of the husk over the masa and filling to close the tamale. Optional: Tie it with a strip of husk. Place in steamer with open ends of the tamales up. Steam until the cornhusks separate from the masa, approximately 1 hour. Carefully remove a test tamale from the steaming pot. Unfold the husk from one side. If it slides off the masa cleanly, the tamales are ready to enjoy. Church Street Café serves Christmas Eve dinner, but you’ll need to make a reservation in October. “If you see balloons, then it’s time to make a reservation,” owner Marie Coleman says, referencing the Albuquerque International Balloon Fiesta. Thankfully, the green chile posole is on the menu year-round (2111 Church St. NW, Albuquerque, 505-247-8522). Rinse posole corn until water runs clear; drain. Place posole, pork, and 10 cups water in large stewing pot. Bring to a boil over high heat. Reduce heat to low and simmer for 3 hours. Add remaining ingredients and additional water, if needed, and continue to simmer for another 2 hours or until posole kernels burst and are soft but not falling apart. Serve warm with tortillas and butter. MARIE&apos;S TIP: Posole and pork may be cooked in a pressure cooker for 45 minutes on medium heat. Posole stew freezes well.